I met Dhardon la briefly in Dharamsala during the 2008 Uprisings in Tibet. She was part of the Tibetan Women’s Association (TWA). At the time, things were so hectic and busy that I didn’t have much of a chance to get to know her well. In 2010, during the Kalon Tripa elections, I attended an event where supporters of each candidate were able to debate one another on the merits of their chosen candidate. Dhardon la was speaking in favor of T.N. Tethong. Previous to this engagement, I had never heard her speak, so this was my first time hearing her. That day, I was standing in the very back with some friends in a packed room. When I scanned the room, I noticed that the majority of the audience there were men and it seemed like it was going to be a tough crowd. Each speaker entered the room and I noticed Dhardon la in a modest chuba right away as someone I recognized from TWA. She was also the only woman on the panel. After each speaker presented their case for their candidate, the Q&A session with the audience began. It seemed that most of the questions that evening were being shot her way to challenge her position. In between all the whooping and hollering by certain male audience members that were trying to distract and intimidate her, she calmly and nonchalantly shot back articulate answers and even had the time to respectfully point out the inappropriateness of some of the male audience members. I was simply amazed at how she handled the crowd of mostly men and herself. Initially I had become nervous with the way some male audience were reacting to her but by the end of the debate, most of the audience members were so impressed, including myself, that my nervousness was replaced with a sense of pride at seeing how a young Tibetan woman handled herself with grace and strength, with a tough crowd of mostly men. It was a proud moment for me as a young Tibetan woman. I felt that though she may not have persuaded audiences that had already made up their mind about their own candidate; listening to the crowd outside after the event, I noticed that she had definitely made a strong positive impression on everyone there that evening. Could you briefly tell me about yourself and how you became actively involved in exile Tibetan politics? I was born and raised at TCV schools (Tibetan Children’s Village). My roots, parents, the community in which I was raised was all part of how I became involved politically. I was a political person from childhood. The TCV schools in which I was brought up instilled patriotism in children. Just look at the school mottos “others before self” and its guiding principle, “come to learn. Go to serve.” My upbringing was connected to serving the Tibetan political struggle. I was also active during my college days in Madras, we would give up on our grades sometimes to work on political campaigns. During my MA final year, I stood a very good chance to receive the gold medal that is given to students who scored highest in all the semesters; however, my last semester coincided with His Holiness’s visit to Bylakupee. At the time I was also part of TSAM (Tibetan students Association of Madras) and we needed to use this opportunity to raise funds for the organization. Since I was a cabinet member, I choose to focus my attention on TSAM instead of my last semester, this caused me to miss out on the internal assessment exams that could have put me in the position to receive the gold medal. Incidents such as this caused others and me to miss out on other opportunities that came our way. In Dharamsala, while I was preparing to pursue a PhD, I met Dr. B. Tsering, the then President of TWA (Tibetan Women’s Association). She expressed that she needed someone to fill in a position at the research desk for TWA. I saw it as an opportunity to have a hands-on involvement for the Tibet cause. In the summer of 2005 I joined TWA for a year; my plans to pursue a PhD were shelved. However, later I received an opportunity from the Department of Education, CTA to study at the University of Edinburgh for a MSC in Counseling Research Studies. During my time in Edinburgh it was very lonely, I became homesick because I missed the political and social life of the Tibetan community-India, which I had become accustomed to over the years. On my return, I rejoined TWA, even though CTA was pulling me to head the media section of the DIIR. Maybe this was part of my destiny; everyone I loved was against me joining TWA for practical reasons but I didn’t care too much for the low pay or facility and decided to go against their wishes and joined. My commitment to TWA was two years, during which I began the application process to pursue a PhD in the States but all that changed when the 2008 uprising in Tibet happened. The 2008 Uprisings in Tibet was a turning point for me. When the first news of the 2008 protests in Tibet broke, I was one of the first persons to cover it, I helped two monks translate a press release about the March 10 protest in Lhasa led by monks from Sera, Ganden and Drepung. Watching and working while the Uprisings took place, hearing first accounts of all that was happening inside, I felt like I was witnessing it up close. It was the first time I strongly felt connected with Tibetans inside, not just spiritually and psychologically, I felt I was there experiencing it with them on the grounds. I decided then and there that this was going to become my priority in life, not family or personal gratification. That’s why in 2010 when it was time for me to shift my path to a PhD, my mind was not into it. Instead, I wanted to stay and continue my work here in Dharamsala, India. During this time, I was voted by the General Body of TWA to become an executive member of the TWA. However, my plans for a PhD took a back seat, because I was enjoying my work. When and how did you make the decision to become the youngest parliamentarian at the CTA? In 2010, TWA ran a mock-election campaign to encourage Tibetans in the community to become actively involved in the Kalon Tripa elections race. After the campaign finished, I decided to become involved as an independent campaigner for the candidate T.N. Tethong. I had no plans or even interest in running for any part of the government. During this time, Youth for Better Democracy (YFBD) was giving out profiles on young Tibetan professionals who they thought would make good candidates for the parliament. My name was on this list. When the elections committee released the results for the preliminary elections, my name was among the 20 people that had been voted. At the time I didn’t think much of it but soon after I was contacted by the local elections committee before the final results for parliament was to be made public, they told me I had been voted 3rd highest in the elections. I was surprised, shocked, and ecstatic but I also became anxious and nervous. I had never really considered that genre of work professionally but after the election results I felt I was being drawn to it. It was a confusing time but there was no way I could withdraw. I gave in and decided to join. As you are aware, there are more men than women in the CTA parliament. How does it feel to be the youngest woman parliamentarian? I am sensing an added responsibility as I represent two very potential groups in our movement-youth and women. Therefore, with a sense of pride there is an overwhelming sense of responsibility, of being accountable to the expectations people have of young women and also to be able to lay the ground for youth and women to gain foothold into political leadership. I am aware that being a parliamentarian requires a lot of work but what would you consider the difficulties and rewards of being a parliamentarian? Unlike the other parliamentarians of sovereign nations where they have the security of having power with responsibility, the Tibetan parliament does not enjoy the same level of power that enables this parliament to serve its responsibilities to the Tibetan people. But I also want to point out that for the Tibetan parliamentarians, we have much more responsibilities to the Tibetan people than governments that do not have to deal with the reality of being pitted against a country like China. Being part of an exile government, I think we are doing something called transnational governance, we are based here in India, but also governing a diaspora community spread across the world. With so much responsibilities to those inside Tibet as well, we as parliamentarians have limited resources. However, despite all the difficulties and the lack of resources, I am always amazed by how our work always falls in place with so much effort that goes beyond our sense of responsibility and understanding. It is incredible to watch the amount of work, effort, and external factors put in by everyone to finish a project. There are a lot of provisions but it all falls in place because we push ourselves. Despite the fate of the game not being certain, we push ourselves and move forward to continue this work. I find that amazing. Just last month we wrapped up the All-India Parliamentary Lobby Campaign in Eastern and North Eastern parts of India. Some of the State leaders assumed we represent the tribal groups of their respective constituencies and upon briefing them about the situation inside Tibet, they were taken aback by all the progress we have made in exile and commented that they laud our commitment and conviction to forge ahead despite all odds. What advice would you give to other young Tibetans, in particular women, who hope to pursue a similar path? I may sound bias, but since joining the parliament I’ve observed that women tend to be more focused and clear. I am conscious of the fact that if people like me do well that it is opening up more opportunities for women in general and for young women to participate. At first, I wasn’t necessarily attracted or interested in becoming a parliamentarian but after doing this for few years as a young Tibetan woman, I feel that maybe other young Tibetan women may find this avenue more approachable and appealing. They can connect to the fact that I am also a young Tibetan woman; this is what I hope at the least. 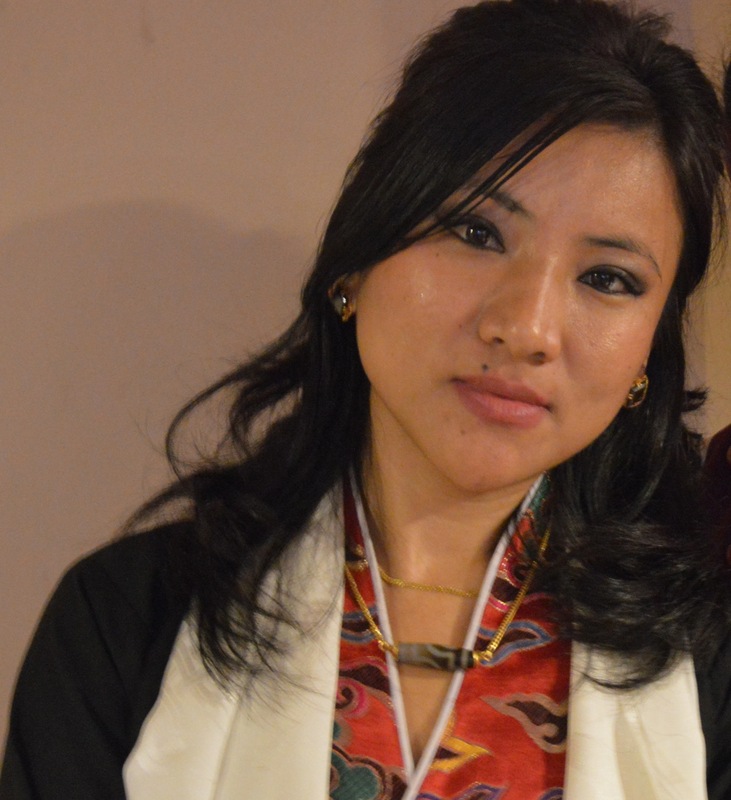 I am aware that I’m not just a parliamentarian, I know I have the added responsibility of letting young women in the Tibetan communities know that they too can take an active part in the Tibetan political life. I don’t think the Tibet movement is just about protests and reacting to Chinese Government and their policies. There’s a lot more to it. The Tibet movement has more scope for intellectual discussions. For example, Tibet can be approached from the global diplomacy point of view. But I feel the general discourse on the Tibet movement overlooks this possibility. I want to pursue a PhD alongside my work as a parliamentarian and as the Co-Chair of the Steering Committee of International Tibet Network. My tougher uphill task is my plans for further studies that will contribute to showing the intellectual sides of the Tibetans and the Tibetan movement. I hope to do a scholarly research in the field of Communications that paints a more realistic, boarder and more complex picture of the Tibet movement that isn’t just about the frustrations or the hopelessness but about resilience and fortitude and its potential as an academic area of interests, considering what it could offer to today’s world both in spirit and in intellect. Congratulations on your work so far and best of luck in the future Dhardon-la. Much respect. Very impressive interview, I’m all amazed to learn of your giant stride and your perspective on what you see as your responsibility or destiny. You could have easily chosen what your loved ones wished for but you chose to serve the country, you implemented the mottos upon which you are raised. So, hats off to you. I’ve seen you few times in London and friend of mine is massive fan of yours but I couldn’t have imagined the path you in at such young age . Well done ! Certainly you represent two important groups in our society . Good luck ahead and you have strength and support to do things in society on which many are failing. Thank you very much Sherab la, I am touched by your comments and must confess that these words of confidence serve as the guiding force in my life. Thank you and i am hopeful of living upto your expectations.